We encourage the the lead teacher to have a pre site visit with the host farmer so issues such as Health and Safety, route planning and lesson planning can be addressed before pupils are on the farm. On the day there are a few important rules that children need to observe, not just to make things as safe as possible but also so they and their classmates get the most benefit from the visit. All pupils should walk behind the deliverer. The deliverer knows the route around the farm and will follow the safest route. If the deliverer shouts ‘STOP’ or blows a whistle everyone must stop still until instructed to move. Again, this is precautionary and designed only to aid safety on the farm. Pupils should remember that farms are not playgrounds. There is always space to let off steam at lunch time so the farm and buildings should be viewed as the ‘classroom’ and the designated area the ‘playground’. We do need the schools to ensure that they have enough ‘staff to pupil’ ratio and that one of the staff members is first aid trained. 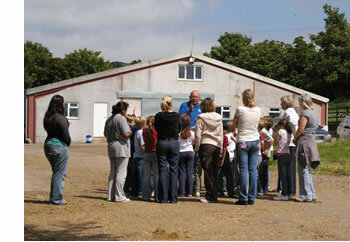 The above rules are set out so everyone can enjoy their lesson on the farm and get the maximum benefit in a safe environment studying in a ‘Classroom in the Countryside’.